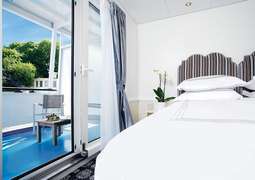 The River Victoria consists of 93 rooms and 10 suites, all of which give you a fantastic view of the passing scenery, with some even containing a private balcony. 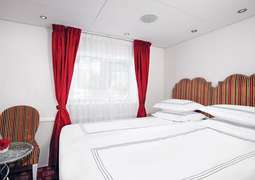 Thanks to its comfortable, stylish and luxurious furnishings, you will easily feel at home in your cabin or suite. Enjoy the best of Russian cuisine as well as other International specialties in the Panorama Restaurant. There is also a coffee bar on the River Victoria which serves various coffees and teas around the clock. In the two lounges you will also have a lot of alcoholic and non-alcoholic drinks on offer. Aboard this ship there is no chance that you will get bored, as there are a number of incredible activities to keep you occupied during your cruise. For instance you can take part in a game of chess with other passengers or borrow a good book from the library. Then during the day you can sit out on the Sun Deck or treat yourself to a massage at the spa and then browse the boutique on board. In the evening there is a regular and varied entertainment program. During the day time you should wear casual attire but in the evenings it is recommended that you wear something more formal.